Mesut Ozil scores a diving header, LOL what? Arsenal got the result in Europe they so desperately needed on Tuesday; their 3-0 win over Dinamo Zagreb coupled with Olympiacos's loss in Germany means Arsenal can still qualify for the knockout phase of the Champions League with a big enough win over Olympiacos on matchday six. But, we'll cross that bridge in December. The Gunners slipped from second to fourth place in the league after last weekend's 2-1 loss at the Hawthorns. Liverpool's win over Manchester City eases the pain a little, as does the fact that it's Leicester City that currently sits at the summit. Arsenal's next three league games are against 16th place Norwich City, 18th place Sunderland, and 20th place Aston Villa. To be quite honest, Arsenal needs to win all three. Those are all in advance of a meeting with Manchester City at the Emirates on December 21. 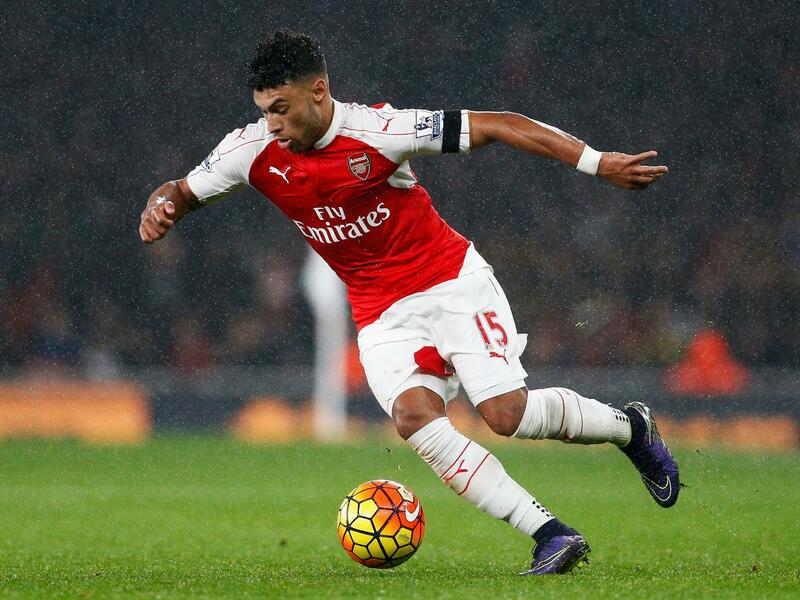 Alex Oxlade-Chamberlain could make the bench Sunday. Arsene Wenger has confirmed that Arsenal will have everyone who was involved against Zagreb on Tuesday available for Sunday, which includes Aaron Ramsey. The Welshman came off the bench on 67 minutes. The biggest question will be regarding Alex Oxlade-Chamberlain's hamstring. Wenger said yesterday that the Ox "should be back in the squad." There's good news on Francis Coquelin's knee, insomuch as he does not require surgery. He's still expected to miss three months, however. The end of February is when we should be looking at him back in training; he'll likely be out longer than the current list of "long-term injuries": Danny Welbeck, Tomas Rosicky, and Jack Wilshere could all make returns by or during January. Mikel Arteta's calf problem has been called "short-term," even though it's starting to feel to me that a more applicable term would be "chronic." Theo Walcott started running this week, but he is not back in full training. He's likely the next one back after the Ox. Predicted XI: Cech, Bellerin, Mertesacker, Koscielny, Monreal, Flamini, Cazorla, Alexis, Ramsey, Ozil, Giroud. Midfielder Alex Tettey picked up a thigh injury on international duty with Norway two weeks ago and has been ruled out of this weekend's fixture. His injury is not expected to keep him out in the long term. Meanwhile, Matthew Jarvis is still a few weeks away from a return from a knee injury. Elsewhere, Kyle Lafferty is fit and available after being removed as a precaution with a groin problem from a midweek Under-21 match, while captain Russell Martin will return to the side after missing's last week's trip to Chelsea for personal reasons. Martin has not played since October 31, when he was sent off against Manchester City for the handball that led to City's winning penalty. Norwich use a 4-4-1-1 formation, with Congolese striker Dieumerci Mbokani likely starting up top with Nathan Redmond behind him, Jonathan Howson and Robbie Brady playing on the wings, and Youssouf Mulumbu and Gary O'Neil playing centrally. Predicted XI: Ruddy, Wisdom, Martin, Bassong, Bennett, O'Neil, Howson, Brady, Mulumbu, Redmond, Mbokani. to need to get Flammened. Arsenal will hope that their midweek win, 3-0 over Dinamo Zagreb, will have righted the ship again. Across all competitions, Arsenal have lost one-third of their matches overall this season (seven losses in 21 matches,) which has led to a fourth place standing in the league, a precarious position in Europe, and elimination from the League Cup by a lower league side. Last week's 2-1 loss at West Bromwich Albion felt like yet another low point, but with upcoming matches against Norwich and Sunderland before their European Judgment Day, there's time to get things going positively again. As for Norwich, the Canaries have just one win in their last eight matches across all competitions. They crashed out of the League Cup on penalties to Everton while they have won just three league matches all season. Their 1-0 win over Swansea on November 7 snapped a four-match losing streak in league play, but they fell to Chelsea at Stamford Bridge last weekend. Norwich are three points clear of relegation at the moment, sitting in 16th place. 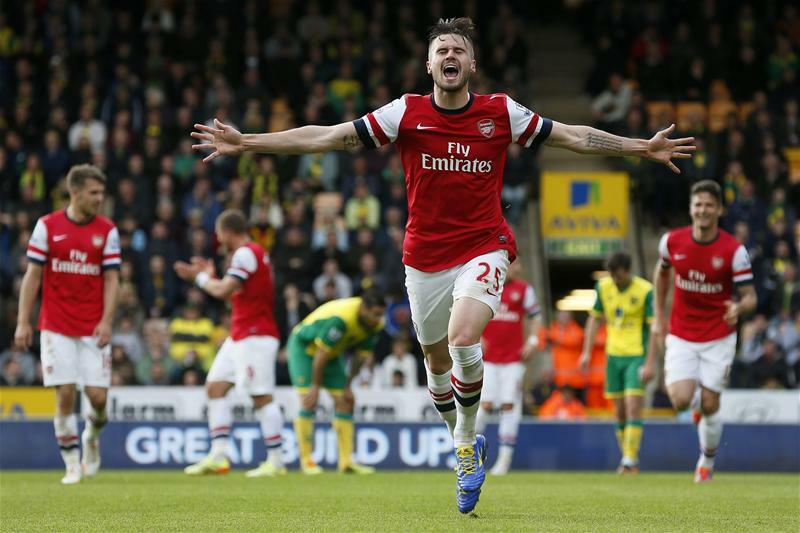 goal in Arsenal's last match at Carrow Road. Arsenal took all six possible points from Norwich City back in 2013/14, when the Canaries were relegated to the Championship. Norwich then yo-yo'ed back to the Premier League, finishing third in the Championship last year before winning the play-off final. But, back to those matches two years ago: Arsenal won 4-1 at the Emirates in October, a match which included Jack Wilshere's endlessly viewed tappy-tappy-tap-tap goal. Mesut Ozil scored twice and Aaron Ramsey added the fourth. 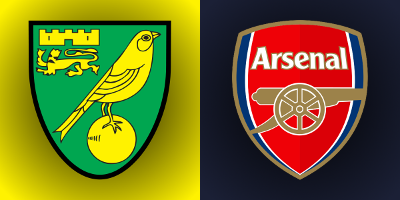 Norwich had, briefly, made it 2-1 during the course of the second half through Jonathan Howson with 20 minutes to play before Arsenal put it away. When the clubs met at Carrow Road, it was the final match of the season, with Norwich all-but-mathematically relegated (they needed a 17-goal swing to survive.) They didn't get it, as Arsenal won 2-0, through Aaron Ramsey and the first career goal from Carl Jenkinson. Jose Mourinho loses his mind yelling at Moss. The referee is West Yorkshire-based Jonathan Moss. Moss has already worked one Arsenal match this season, the 2-0 win over Stoke City on September 12. That means Arsenal now have 11 wins in 11 total competitive matches with Moss as the referee; that includes last year's FA Cup Final win over Aston Villa. Norwich City have seen Moss once so far this season, for a 3-0 loss at Southampton in August, in which defender Steven Whittaker picked up two yellow cards in just 31 minutes. In a funny twist, Moss accidentally did not pull out his red card after the second yellow and showed Whittaker his notebook instead. 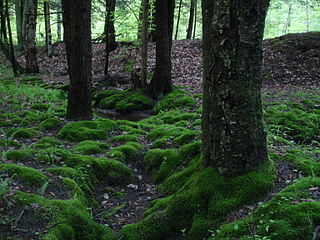 Moss, of course, was most recently in the news when Jose Mourinho rampaged at him after Nemanja Matic's first half red card in Chelsea's 2-1 loss at West Ham. He also took charge of last weekend's big match between Manchester City and Liverpool. John Painting is a contributing writer to the Modern Gooner and a major Micronesian holiday. You can follow him on Twitter @zorrocat to celebrate.